12. Car share or take turns with friends, if you are going to work or taking dropping off the children. Remember cost such as parking etc will then be halved. 13. Use public transport in the city: this can save you money and time (no parking charges!). Consider purchasing a travel pass to increase your savings. For example the cost of filling up your car could cover a months worth of travel! Consider working from home if you can, especially with the growth of the internet, email and mobile phones. Imagine no commute, your never late, wear what you want if anything! 14. Try switching off the engine when you’re waiting for longer than 30 seconds. The car will use less energy when you switch it off and on than if you would leave it on for longer than 30 seconds. 15. Don’t let your vehicle warm up in a standing position. If you go immediately, the motor will be able to reach its working temperature quicker, saving petrol and emissions. 16. Put the car in the highest gear as soon as possible as the most economical 4th (or even the 5th) gear. For example with a constant speed of 50 km/h a normal car uses per 100 km 7.5 litres of petrol in the second gear, 5.5 litres of petrol in the third gear and about 4.5 litres of petrol in the fourth gear. 17. Try to fit your car into the rhythm of the traffic lights so that you don’t have to brake and accelerate all the time because of a red light. 18. Don’t drive at the highest speed level, especially not on the highway. 19.Try to avoid using your car for short distances. A cold motor uses about 40% more energy on such distances as usual. Choose to walk or cycle. 20.Traffic jams are not only annoying but also expensive. 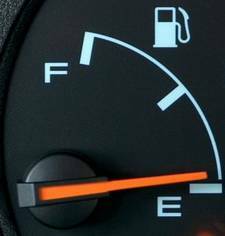 If the average speed decreases from 50 km/h to a walking level of about 3.5 km/h you will need six times more petrol than usual. If you are already in a jam keep in mind that you will save petrol by switching off the car. 21. Keep your distance is not only important for your safety within the traffic but also helps to prevent unnecessary braking and accelerating, so you are able to drive with the need of less petrol. Do you have any more tips send us your comments.